In English, "Steller's sea eagle", "Pacific eagle" or "white-shouldered eagle." In Russian, "morskoi orel" (sea eagle), "pestryi morskoi orel" (mottled sea eagle), and "beloplechii orlan" (white shouldered sea eagle). First classified Aquila pelagica (Pallas 1811 or 1826, depending on source). Subsequently, many generic and specific names variously spelled, e.g., Haliaetus pelagicus. Haliaetos pelagica. Faico leucopterus. Faico imperator. Thalassaetus pelagicus. Thalassaetus macrurus. Haliaeetus macrurus. and most recently Thallasoaetus pelagicus. Uncertain. Two by some authors: H.p. pelagicus throughout most of the range and H. p. niger in Korea, the latter lacking white areas on the forehead, shoulders, and legs. H. p. niger variously considered to be a separate species by some authors (but probably is not) and by others only a color phase of H.pelagicus. Seventeen of 18 records are from Korea, but birds with typical plumage also have been obtained there. The dark form is said to be rare if not extinct. 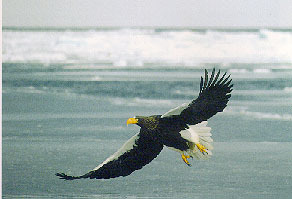 Steller's sea eagle is one of 8 species of sea and fish eagles in the genus Haliaeetus. The genus includes large to very large eagles with powerful bills and feet, rather short legs, unfeathered tarsi, and often bold color patterns in adults. The genus is nearly cosmopolitan in distribution. Sea eagles frequent coasts, lakes, and rivers, often scavenge fish, but also take live fish, birds, and mammals. The adult Steller's sea eagle is characterized by immense size, dark brown to black plumage with prominent white tail, shoulders, thighs, forehead, and usually crown (except H. p. niger). and a yellow, very deep, strongly arched and compressed beak. Rump, upper and undertail, and underwing coverts also white. Eye, cere, and legs are yellow, the tail wedge-shaped. Males and females are similar, but females are noticeably larger. Wing length of females up to 680 mm, males 590. Weight of females up to 9 kg, males 6 kg. First down plumage of nestlings is silky white, the second smoky brown-gray. As in other sea eagles, remiges and retrices of first-year (Juvenal) plumage are longer than adults. Juvenal plumage is uniformly dark brown with white feather bases and light mottling on retrices. Iris is dark brown, legs whitish, beak blackish-brown. Through at least three intermediate plumages, mottling in the tail decreases, body and wing feathering acquires a bronze cast, and the eye and bill lighten in color. Definitive plumage is probably reached in the fifth calendar year (based on fragmentary data from captives). First and intermediate plumages difficult to distinguish from those of the white-tailed sea eagle (H- albicilla) with which it shares all of its breeding range. Occurs only in eastern Asia. Probably breeds only within the former Soviet Union along the Sea of Okhotsk and Bering Sea coasts, including the Kamchatka Peninsula, its greatest stronghold, from the Koryak Highlands (Apuka River, Paul's Bay) south approximately to the Amur River. Also nests on northern Sakhalin Island, the Shantar Islands, and at least some of the Kurile Islands. Breeds inland along river valleys and on lakes throughout its range. Early authors included Korea in the breeding range (H.p. niger). but its former and present status there is uncertain. The wintering range is to some extent congruent with the breeding range. Inside the former Soviet Union migrants concentrate in the Primorski Region, and in Japan on Hokkaido, northern Honshu, and nearby islands. A few migrants reach Korea. Stragglers north to Anadyr, west to Yakutsk, southwest to Beijing, southeast to Midway and Kure atolls, south to the Ryuku Islands, and east to coastal Alaska. Many individuals are resident in the breeding range, in winter moving only to open water. Others gradually move south in autumn, and by winter appear outside the breeding range. On Kamchatka, eagles overwinter in forests and river valleys near the coast, but are irregularly distributed over the peninsula.Most appear to be resident adults. Elsewhere, the timing, duration and extent of migration depends on ice conditions and food availability. Each winter, drifting ice on the Sea of Okhotks drives thousands of eagles south. Ice reaches Hokkaido in late January. Eagle numbers peak in the Numuro Strait in late February. On Hokkaido, eagles concentrate in coastal areas and on lakes near the coast, along with substantial numbers of H. albicilla. Eagles depart between late March and late April, adults typically leaving before immatures. Migrants tend to follow sea coasts and are usually observed flying singly. In groups, migrants are typically observed flying 100-200 m apart. On Kamchatka, most migrants are birds in transitional plumages. The breeding period varies from region to region, depending on climate and food availability. On Kamchatka, birds begin drifting from wintering to breeding areas in late February. Nest building begins in late February and early March. Copulation occurs on the nest, and first clutches appear in mid April, occasionally earlier. The egg-laying period continues through late May. The incubation period is unknown, but lasts longer than 34 days. Judging from observed size differences in nestlings, incubation begins with the first egg. Hatching occurs between mid May and mid June. Clutches consists of 1-3 eggs, usually 2. Young fledge in August or early September. Nests are always found near the mouths of rivers, in river valleys, along sea coasts, or on lakes. Nesting is most common in the coastal zone, where rocky shorelines, timbered river valleys, bays, and inlets are preferred. In the interior, nesting occurs less frequently in river valleys and on lakes. On Kamchatka, park-like stands ofErmann's birch (Betula ermani) and floodplain alder-willow-poplar forests (Ainus. Salix. Populus spp.) are preferred. On the east coast, nests are usually within 30 km of the coast, but a few are 50 km or more inland. On the west coast, many pairs nest 50-80 km from the sea. Elsewhere in the range, nests on major rivers may be 100 km or more inland. Throughout the range, nests usually are in trees and occasionally on cliffs. On Kamchatka, nests are built most often in poplar and birch. All nests in the lower Amur and most on the Sea of Okhotsk and Sakhalin Island are in larches (Larix spp). Nests are typically in the tops of large, mature trees, usually with a dead top. Less often nests are constructed in healthy trees. Nests may be 15-20 m from the ground. Nests are often used for several years in succession, but alternate nests are often built, usually within 900 m of the previous nest. Nests are bulky, constucted of thick branches and twigs, and may reach 2 m in diameter. On one occasion, 2 occupied nests were only 100 m apart. Breeding success appears to be poor. In any given year on Kamchatka, 45-67% of eggs produced will fail to produce young to fledging, and up to 27% of nestlings will be lost. Failed nesting attempts occur most often due to predation (sable and ermine) and collapsing nests. No nests with 3 fledging-age young have been recorded. All of the breeding range is shared with H. albicilla. Prey and habitat preferences of both species are the same, but on Kamchatka the congener predominates in places where H. pelagicus is rare or sporadic. Where the two species do occur together, H. pelagicus. the larger of the two, seems to accept the former's presence. The diet consists principally of salmon (family Salmonidae). taken both living and dead. The species' distribution and seasonal appearances are dictated largely by the availability of the salmon supply. The remainder of the diet is highly variable and important only when the principal food supply is scarce. In summer and autumn, the lakes, rivers, and streams containing salmon runs, together with the coastal areas, form the main feeding grounds. Thus, nests in Kamchatka invariably occur near spawning waters of salmon, and communal feeding is common. At the height of the spawing period (August-September), feeding aggregations reach their peak. On Kamchatka, aggregations of 700 birds have been reported, but much smaller groups are more common. During this period, young in the nest are fed on fish 20-30 cm long. On average, food is brought to the nest 2-3 times a day. In summer, spent fish are taken after spawning. In autumn, dead fish are typically taken. Three hunting techniques and pirating have been observed. Most often, eagles hunt from a perch in a tree or rocky ledge 5-30 m above the water. When prey is spotted, the bird dives from its perch. Eagles may also hunt on the wing, while circling 6-7 m above the water. Again, prey is captured by diving. Eagles sometimes hunt by standing in shallow water on a sandbank, spit, or ice-flow, grabbing passing fish. Where feeding occurs in groups, kleptoparasitism is common. Kleptoparasitism is most beneficial in procuring food during periods of food abundance and in large feeding aggregations. Immatures use kleptoparasitism as much as adults, but are attacked more often by adults than birds of similar age. Adults appear to benefit most from this behavior. The bold color patterns of adults may be an important signal influencing the formation of feeding groups. Outside the breeding period, birds probably roost communally near their feeding sites. On the lower reaches of the Amur River, summer diet consists of about 80% fish, 10% birds, and 5% mammals. Invertebrates (crabs, sea urchins, mussels, and squid) washed up on shore are also eaten. Along coasts, invertebrates and carrion (e.g., seals and sea lions) probably form a greater part of the diet of young birds. On Kamchatka, prior to the arrival of salmon, ducks and gulls may constitute 50-70% of the food fed to nestlings. After spawning, salmon returning to the sea may also provide an important food source up to the onset of winter. Eagles overwintering in Kamchatka take hares, ermine, sable, and fox (sometimes from the traps of commercial hunters). 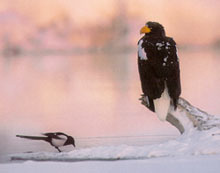 During winter, H. albicilla and golden eagles (Aquila chrysaetos) may also occur in feeding groups. On Hokkaido, eagles are attracted by abundant cod which peak in the Rausu Sea and Nemuro Straits in February. This resource supports an important commercial fishery which in turn helps to support eagles. In February, the commercial catch can reach 1,250 tons offish daily. If only 0.5% of the catch escapes or slips into the water, enough food becomes available to feed thousands more eagles than are gathered. In Kamchatka, 320 pairs have been recorded. An additional 89 nesting areas are not monitored. In the mountains of Koryakan and along the Bay of Penshina, over 1,200 pairs breed and at least 1,400 juveniles occur. About 500 pairs live in the Khabarovsk region of the Okhostsk coast, and 100 on the Shantar Islands. Another 600 pairs occur in the lower Amur. There are 280 pairs on Sakhalin Island and a few on the Kurile Islands. The total population is approximately 3,200 breeding pairs. At least 3,500 birds winter on Kamchatka, and another 2,000 on Hokkaido. On the whole, the species' outlook is favorable. Throughout its range it is protected by law. In Japan it is designated a National Treasure. On Kamchatka, most birds live in Nature Reserves or other protected areas. Numbers in this largest and best known population are stable. Outside the breeding range, food bases in the principal wintering areas are so far secure. A variety of limiting factors, however, both natural and human in origin, may be inhibiting population increases. A primary factor presently limiting nesting success is the instability of nests. Also, food supply during severe winters may be an important limiting factor. Persecution of the bird continues due to its habit of stealing furbearers from trappers. Growing fears of industrial contamination of food sources in the southernmost portions of the winter range may be well-founded. Foremost among conservation measures must be strict law enforcement to prevent disturbance at nesting and feeding areas and their outright destruction by hunters and trappers.